People ask me all the time how I know that Voxy works, and, depending on how much time I have, I explain that our platform was designed using the results of decades of empirical research. I say that we offer personalized instruction that adapts in real time to learners’ needs, and that we teach people the real English required for them to accomplish their goals, whether that’s acing a job interview, filling out an application, or understanding the notices that get sent home from their children’s schools. And then I go on to explain that we’ve been testing Voxy’s effectiveness since the moment it was built. In 2012, we did a study with learners at a university in Mexico who had repeatedly been unable to get the TOEFL scores they needed to graduate. After just five weeks of Voxy, we were able to raise their scores 22%, which was a striking finding given that their scores had historically remained flat. In 2014, we began measuring efficacy with Voxy learners, demonstrating that thousands of learners improved their proficiency if they used the platform. We presented those findings at peer-reviewed, academic conferences around the world, from the Second Language Research Forum to the Task-Based Language Teaching Conference to the international conference on Teaching English as a Second Language. We also established a framework for evaluating the effectiveness of technology-mediated language learning programs, presenting it at the Georgetown University Roundtable in Linguistics in 2016. And we’ve gone on to use this framework, which looks at the amount of time learners spend in the platform, their mastery of language and content, stakeholder feedback, and evidence of real-world success, to demonstrate that Voxy works in hundreds of diverse learning contexts around the world, from refugee camps in Lebanon to European manufacturing plants and from corporate boardrooms in São Paulo to college campuses in North America. The one thing that all of this research has in common, though, is that it’s been conducted by Voxy. Now, the thing about having a quantitative research degree and a background as a principal investigator on large-scale, government-funded projects is that I know how to conduct this type of rigorous research. But that doesn’t mean that there isn’t perceived bias–we are the ones conducting the research on something we’ve built. And that is exactly why I am so excited to present the latest chapter in Voxy’s research history, the results of an empirical study conducted by perhaps the most well-respected independent research organization in the U.S., American Institutes for Research. Building on work that AIR had done in 2018, which pointed out that the needs of English language learners were not being met by one-size-fits-all approaches at institutions of higher education, this new study confirms that Voxy can help solve this problem. 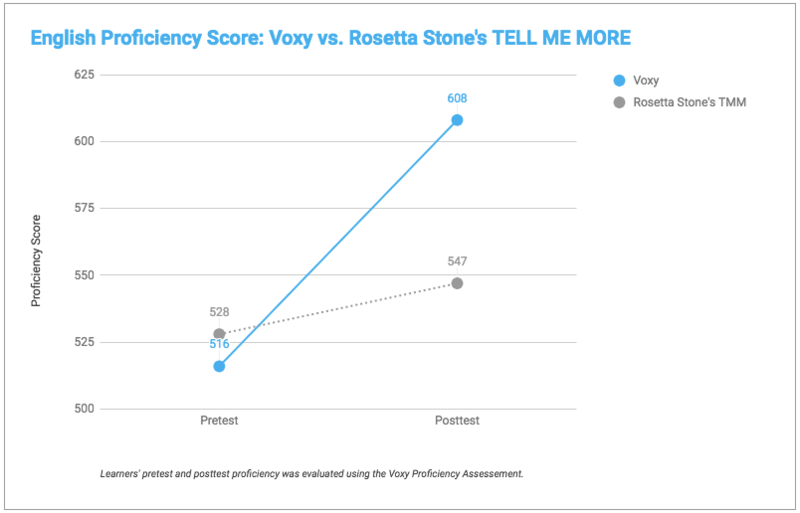 AIR researchers demonstrated that learners who used Voxy significantly improved their English language proficiency when compared with peers who were given access to traditional language lab software (in this case, Rosetta Stone’s Auralog TELL ME MORE). Further, learners accessed the Voxy platform outside of class time, spending nearly 75% of their time learning when they were not in class, suggesting that Voxy’s personalized language learning software keeps learners engaged and working outside of class time. These findings are so exciting because they confirm all of the research that we’ve been conducting in-house; not only does Voxy work, it works better than traditional approaches, and it drives engagement in out-of-class learning. 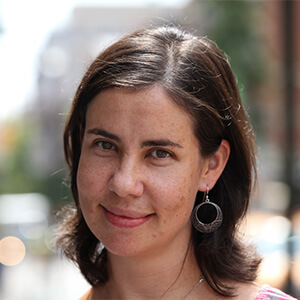 The U.S. does a lousy job meeting the needs of its non-native speakers, and this research from AIR should help us demonstrate that our personalized, needs-based approach to language learning can and should be part of the solution.